A few weeks ago, I blogged about the Seattle Times series on coastal ocean acidification, which dealt with supposedly “lethal,” “corrosive” coastal waters that were killing oyster larvae in some commercial hatcheries a few years ago. The ST suggested that mankind’s emission of CO2 was having profound effects today on shellfish in Northwest waters. I argued that the ST story was exaggerating the current impacts of CO2 increases and neglected a key point: that the short periods of lowered ph (a measure of acid/base ) were predominantly caused by natural variability. The truth is that mankind's CO2 emission is actually a very minor player in the current problems at local oyster larvae hatcheries. The response of the Seattle Times to my blog was rapid and pointed. They put up a page on their glossy “Sea Change” web portal saying that my blog “ignores the science” (see above for a sample) and refused to allow me to submit a response that would also be available on their site. Unfortunately, none of their response to my blog dealt with the scientific questions I raised, rather their defense was that they had talked to the experts. I had a nice conversation with Danny Westneat, one of the few ST staffers with a science background (B.S. Chemistry). But he wasn't interested in talking scientific details either. Just process. Not exactly a pristine setting. Over the past weeks I have done extensive additional research, including talking to UW specialists in coastal oceanography and ocean acidification, as well as several individuals in the local shellfish industry. I have received nearly 50 emails and comments and more than a dozen calls. Many, including academic researchers and industry insiders, told me I got the facts right. The additional information I have secured has solidified my conclusion that the ST article strayed from key facts and avoided mentioning information that did not fit well with their “story.” The true story is far more complex and nuanced than the ST article suggests. In this blog, I will go substantially beyond my previous note, with more technical detail and scientific evidence. You judge for yourselves where the truth lies. Where are the “lethal” waters? The Seattle Times emphasized the “lethal” waters that were killing shellfish, particularly oyster larvae. But the truth is that native shellfish species living in our waters have been doing fine. In fact, even non-native species growing in our natural aquatic environment have been doing well. 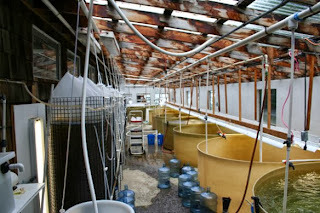 The problem was limited to factory aquaculture of non-native species. Or to put it more exactly, limited to big tanks containing oyster larvae of non-native Pacific oysters from Japan. Oyster larvae that could not reproduce in our cold waters, with or without any extra CO2. The problems only occurred in these oyster larvae factories during short periods during summer when there was strong upwelling of coastal waters-when cold, high-CO2 waters located at depth were lifted towards the surface as a result of stronger than usual northerly winds. That puts a different edge on the issue, doesn't it? As I will discuss later, the oyster larvae factories (located on Washington and Oregon coastal bays) no longer have a problem with oyster larvae death. The problem has been essentially solved. And let me say this again: the shellfish industry is using a non-native oyster species that can’t reproduce successfully here in the NW because our waters are too cold. That is why they have to artificially hatch the larvae in warmed waters in commercial plants. Some of the Seattle Times critics of my blog complained that I did not talk about aragonite, a measure of the amount of carbonate ions in the water; the reason I did not do so was because the ST article did not talk about it. But let’s do so here. The shells of oysters, clams, and the like are made up mainly of calcium carbonate (CaCO3) and are sensitive to the concentration of carbonate ions in the water. The reaction of CO2 with seawater reduces the availability of carbonate ions (CO3). At the same time, CO2 also decreases the ph. A measure of the availability of carbonate ions is the aragonite level (indicated by the Greek letter Omega). When the aragonite level is greater than one there is supersaturation of carbonate (good for shell formation), when less than one the water is undersaturated and it is harder for shellfish to build shells. As shown in many studies, there is a close relationship between ph and aragonite levels: as the ph of water goes down (less basic), the aragonite level declines. The paper by Barton et al. 2012 illustrates this very close relationship between ph and aragonite level during a summer month they studied (see below). No one is going to argue with that. Ph and aragonite levels at Oregon's Netarts Bay, 01 June–03 August 2009. Notice how closely they follow each other. An essential point I am making is that natural variability in acidity/ph (and thus aragonite level) in Northwest coastal waters is FAR, FAR larger TODAY than the contribution by human-injected CO2 in the atmosphere. The problem in the hatcheries were first noticed in 2006 during which the die-offs of oyster larvae only occurring during strong upwelling periods, when high pressure off the coast produces strong northerly winds that caused cool, low-ph water to rise towards the surface. 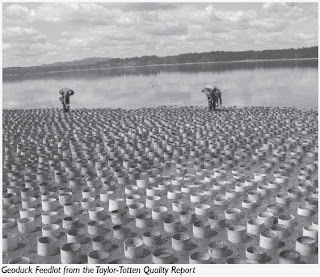 In 2009, a field experiment (published in Bartons et al 2012) took detailed measurements of water from Oregon’s Netarts Bay at one of the hatcheries (see figure above). As you can see from that figure, ph varied from nearly 8.2 to 7.6 (about .6 ph units). You will also notice there were huge daily swings of ph of around .4; this is due to photosynthesis during the day reducing the CO2 levels and thus increasing ph. This point is important…keep it in mind for later. The Barton et al paper and several others document the fact that the periods of lowest ph level are associated with times of strong upwelling. So how much of the low ph is is associated with human-connected CO2? If the Seattle Times is right, then humans are making a substantial contribution to low ph and the "lethal" factory waters. We can calculate this. open ocean ph were about .1 lower than today. Before industrial society, the CO2 level was about 280 ppm, about 45 ppm less than in 1971. So let's assume that the upwelled waters today were exposed to 1971 levels of CO2. So it is very reasonable to assume that the contribution of human-produced CO2 levels to the ph change today in upwelled waters is thus (45 /120)*.1 or .0375. Let’s round that up to .04. Consider the implications of this. The lowest ph observed that (2009) summer (7.6), would have been 7.64 without human CO2. Doesn’t seem like such a headline grabber does it? To but it another way, human CO2 impact is 6.6 % (.04/.6) of the natural variability observed that summer. To put this in further perspective. Imagine a heat wave in which the temperatures are 20F above normal one day. Imagine that CO2 increases explained 6.6% of that. This would be 1.32F. The heat wave was made slightly worse, but the heat wave would have happened with or without the CO2. Later in the century the story will be different. In 50 years, human impacts on ocean acidification will be twice as large—still smaller than natural variability, but more significant. And why did problems start in 2006? One potential reason: a source of natural variability in Pacific Ocean circulation, the Pacific Decadal Oscillation (PDO) had just switched into its cold phase after being in a warm phase since the late 1970s. 2006 was also a very strong upwelling year. Joint efforts between scientists at Oregon State, the University of Washington, and NOAA PMEL helped solved the initial mystery of why the hatchery larvae were dying. The oyster larvae in the factory tanks did not do well during upwelling periods of low ph and low aragonite levels. And the solution was relatively easy. The hatcheries were pulling water in during the morning when ph was low. They changed their procedures to acquire water during the afternoon when ph was higher (natural photosynthesis during the day pulls CO2 out of the water) and that seemed to solve the problem. 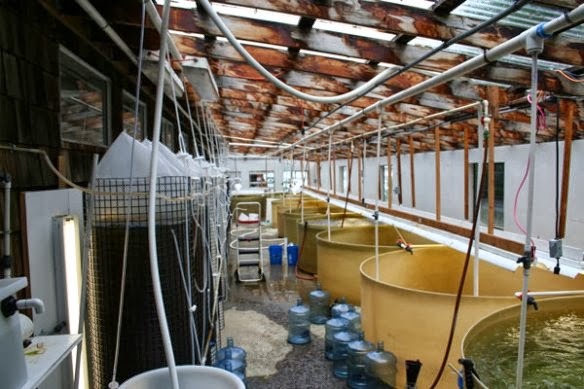 Some oyster larvae factories also enhanced the carbonate levels by adding some chemicals. So the Seattle Times is trying to make a headline story of a very small issue that has been alleviated by improved factory procedures. As noted in research such as Feely et al 2010 (Estaurine, Coastal, and Shelf Science, 88, 442-449) the ph and argonite level situation is very different in inland bodies of water like Puget Sound. They note that in the shallow surface waters of inland Washington there was no problem during the summer (e.g., August 2008) with the aragonite (calcium carbonate ions) being saturated or supersaturated everywhere (good for shellfish). The waters were not hitting the lower phs observed on the coast. This is to be expected considering that deep coastal waters with low ph can only get inland in the deeper subsurface waters. In the shallow inland waters, photosynthesis, warmer temperatures, and different water origin keep things fine for oysters and other shellfish. That is why the oyster larvae can be transferred to beds in Puget Sound to grow big and fat. Furthermore, Feely et al and other papers document that there are other human-related factors in Puget Sound the can influence ph and oxygen levels, like nitrogen-rich effluent from farms, sewage, and other origins. Or the impacts of heavy precipitation and intense river outflows. Not so simple. Even more so than on the coast, human enhanced CO2 levels in the atmosphere is a very minor player in the ph and aragonite levels in Puget Sound and other inland waters. Factory Shellfish Farming: Do they bring environmental risks? 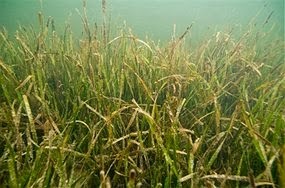 And after killing off these crustaceans, eel grass is growing unchecked by natural predators, so the shellfish folks are spraying herbicides such as Imazamox. As shown in the first photograph in this blog, there is the massive use of plastic in the Puget Sound beach environment--another concern. 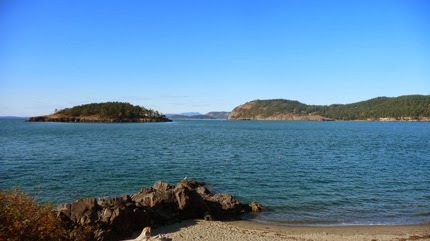 There are environmental groups that are trying to bring such chemical applications and other issues connected with shellfish aquaculture to the attention of local citizens and the State, one example is Protect our Shoreline. Why did the Seattle Times tell only part of the story? The Seattle Times article did not concern itself with the environmental impacts of the large shellfish industry? Why? I believe the reason is that it did not fit their "story" that human-enhanced CO2 in the atmosphere is the real villain. And why did the Seattle Times focus on a very minor issue for oyster aquaculture (ocean acidification) and why did environmental activist groups jump on this story? I suspect many of them are determined to find an acute example today of the impacts of growing levels of CO2 in the atmosphere. The truth is that anthropogenic increases in CO2 are only having subtle impacts on our regional weather today, the big changes and impacts will occur decades into the future. Both global warming and ocean acidification are very serious issues and by the end of the century their impacts will be substantial. But exaggerating and hyping the effects today are unacceptable. Citizens and policy makers deserve the facts, not exaggerations designed to elicit the proper response. Crying wolf in the end is counterproductive and undermines the credibility of science to promote the proper actions is unacceptable. Hopefully, I have convinced you that this is a complex issue, one deserving of additional research. We are fortunate, that with the support of the State, the UW has initiated an Washington Ocean Acidification Center, and in concert with local colleagues at NOAA PMEL, they hopefully can further unravel the science. From the Seattle Times web site. Not stretching things too much. Killing BILLIONS of oysters. Thanks for taking on the Times and filling in the whole background of an important local issue. Great article, reminds me of the science I used in my reef tank 20 years ago. It's a shame to see the left committing the same sins as the right. Hopefully our society will become educated enough that our commercial funded news organizations can present scientific principals rather than eye catching phrases. Thank you. I loved this. My father, who was a journalist major, told me in my youth to never trust what I read in the papers. I assumed it had to do with limited time (to research a story) and space (for putting in all the details). I was always glad I took that advice to heart. Today I think reporters/newspapers have agendas. Making money perhaps? You write that "The reaction of CO2 with seawater reduces the availability of carbonate ions." My recollection of Chemistry is that CO2 combines with water to produce a hydrogen ion and bicarbonate, and bicarbonate further dissociates into another hydrogen ion and carbonate. This is a two-step reversible equilibrium reaction, so that increasing CO2 concentration drives the reaction to the right, increasing rather than decreasing carbonate concentration. The Seattle Times should be happy because controversy sells news. Good to put out some real information. I'm proud to see that people like you are willing to speak up on topics regarding the environment. The best decisions can be made when all the facts and information is out in the open. Thanks very much for your article. No one knows anyone else's motives unless they tell us, and even that might not be accurate. But your guess that the Times was looking for an example of global warming's impact strikes me as plausible. As a former journalist, I would further guess that you were stonewalled because the Times intends to enter its series into the Pulitzer Prize derby. If so, they could hardly come out with a correction that would essentially invalidate the whole thing. Much easier to brazen it out, and label you a science-free crank, even if the opposite is true. A further factor is that the Seattle Times circulates in a city that arrogates to itself a largely undeserved environmentalist self-image. To express dire concern about our killing the oysters plays right into the faux-environmentalism so rampant here. An example other than their series would be the ban on plastic grocery bags. Research shows that all of the alternatives contribute more to greenhouse gas emissions, and to conventional pollution. That research is readily available, but just try telling anyone about it. I'm sure the newspaper will continue to ignore you. The alternative -- a retraction -- would be too painful to contemplate. It does make one wonder the agenda of the "experts" willing to contribute to such a "story." Did the Times cherry pick what they wanted to hear? 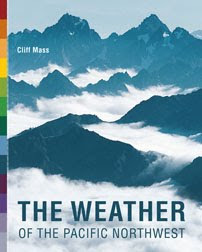 Or does the series reflect an agenda of alarmist environmentalists? China coal burning = hurts a state industry. Or carbon dioxide = hurts a state industry = cap and trade. Or is there an industry connection? Maybe the aquaculture folks want the state to scramble to provide them with support by showing how "at risk" they are? Seems if someone wanted to win a Pulitzer, finding out why the Times published such a bad piece of science as alarmist fact would be a better candidate for a prize than the Times series itself. Maybe a job for The Stranger! Finding middle ground is always a bit problematic. While I may not always agree with you, I feel a bit better knowing an ongoing discussion exists. How could the EPA and the state Ecology allow this wholesale pesticide application to a natural ecosystem- just when we are beginning to get a handle on PCB's and PBDE's- now we are going to deliberately add another halogenated pesticide! Thanks to Cliff for bringing this to my attention. 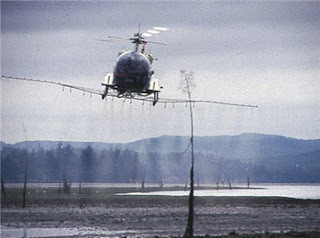 Except for very small scale use (such as in some medicines, for example) we need to ban the use of halogenated pesticides. Period. They are too persistent. A note from a chemist (me) to Alan: It is true that adding CO2 to PURE water produces a very low carbonate ion level- low because carbonic acid is a weak acid. Since salts of weak acids and strong bases tend to be somewhat basic, many metal carbonates will be fairly strong bases if they are soluble. Now, most of the carbonate in the sea is due to the solubility of carbonate rock- and coral- mostly calcium carbonate. That is why the ocean is alkaline. Adding carbonic acid (CO2 plus water) will add hydrogen ions to the carbonate ions, yielding two bicarbonate ions- shifting the equilibrium. Bicarbonates are more soluble that carbonates, so re-establish equilibrium, the effect will be to tend to dissolve limey seashells , carbonate rock, and coral. 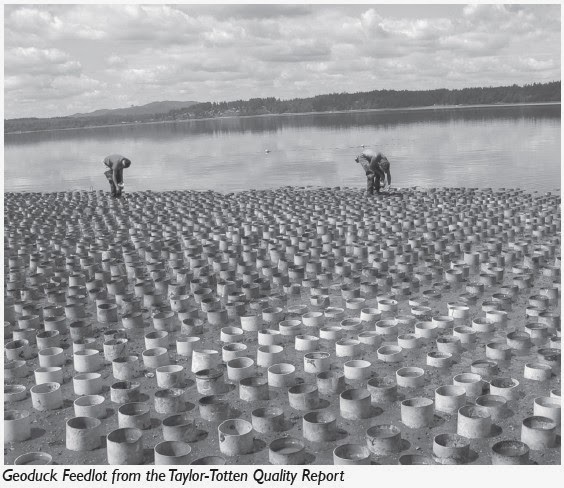 Pesticide use and other practices by shellfish growers on Willapa Bay and elsewhere on Western Washington's marine waters raise serious issues, and one could even argue that the non-native oysters being grown are an invasive species here. There might well be serious questions with the Times piece -- my initial reaction was to wonder if ocean acidification was really that big of a deal RIGHT NOW. Like Cliff wrote earlier, razor clam numbers right now are very high on the coast. But I wonder why Cliff raised some of those other issues, like plastic tubes for geoduc aquaculture and pesticide use on Willapa By, that seem unrelated to the specific issues in the Times piece? I see much talk from Cliff about the fact that this will be a major problem in a few decades. Which isnt that far off. Yet the only thing I see discussed on this blog is about how people are overreacting NOW. This is all just about semantics if you agree that this will have a major effect on our planet in the future. Its a much better stance to overdo something rather than underplay potentially the greatest threat that we face today. A few years back at the 6th North American Echinoderm Conference (this was held at the Rosario Marine Labs near Anacortes) it seemed the topic du jour was Ocean Acidification (OA). Endless talk after talk on this and that similar OA experiment, most of them using one common Florida species (Luidia luidia) and usually only one approach (arm regeneration rates, mobility, etc.) and most of them indicating that acidification had some impact. My general impression is that most of these experiments were rather poorly designed. Only one of such talks used a multiple approach and her conclusion was that she could not specifically rule out other causes or simple randomness of data. Hers was the only one that I liked. I wonder if in the peer review process of such papers that perhaps OA papers from some OA researchers are being sent to other OA researchers, who all generally have a belief system about this (if they all agree, what point is the peer review process? It would be as bad as Creation Science). Perhaps the new OA Center at UW could include some such as yourself who aren't convinced about the impacts, and who can discern the fact vs. the belief systems. This would be a very good thing. We appreciate that Cliff Mass is telling the "other side of the story" so citizens have the opportunity to hear the facts, not industry hype. Another part of this story that is not being disclosed by the shellfish industry, is that the Pacific larvae has been genetically altered which reduces their genetic vigor. The diploids where replaced with triploids that do not spawn so they can be sold all year around. To make even more money, the shellfish industry is trying to grow tetraploids, which grow even faster but are also dying according to small oyster growers. 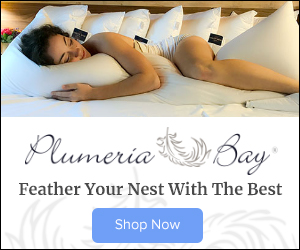 All of this is being blamed on ocean acidification, so the industry will receive federal grants and the taxpayer is heavily subsidizing their oyster hatcheries. Also it brings them massive free publicity at taxpayers expense. Just a few weeks ago, Minterbrook Oyster had a write up in the Key Peninsula news that their new owner was blaming his oyster failures on ocean acidification. How much taxpayer money is going to be given under the banner "Ocean Acidification" to these growers as a handout that rewards bad business practices and a lack of disclosure. Scientists and the media have to give folks the straight truth, period. I couldn't possibly agree more with you! Facts are so much more valuable that the tendentious speculation that masquerades as "news" these days. When I was coming up in journalism, I was trained by old-school types whose mottos were things like, "If your mother tells you she loves you, check it out," and "Never assume anything." Now, it's also true that we learned other things, like, "If it bleeds, it leads." But you still had to check your facts. They really hated to have to run a correction, but the papers I worked for always WOULD run the correction if the story was wrong. It's just shameful that the Times would smear a critic as they've smeared you, Cliff. Really awful. Great article, reminds me of the science I used in my reef tank 20 years ago. It's a shame to see the left committing the same sins as the right. This kind of thing is just rampant in Seattle. Frankly, I think it's what you see anyplace where one mindset dominates for a long time. Human nature overrides politics. Whatever the "settled wisdom" of this or that dominant group might be, it gets entrenched over time and people build their lives around it. Seattle is chock full of sacred cows, same as any place dominated by the right wing. While it may be great fun to rant about media hyperbole, one should still ask What will our oceans be like when equilibrated to an atmosphere of say 1,000 ppm CO2? or 1,500 ppm CO2? We can look at the geologic past and that past does not look good for our current ocean ecosystems and a very large extinction event should be anticipated. So while bashing journalists and reporters is easy pickings and makes us all feel smart, we still have a problem and a very big one at that. Perhaps there is a better way to present the problem than the Seattle Times articles or other media outlets. Given the references you site and your recent journal research I would hope you could take the time to provide a much more informative and accurate take on ocean acidification and show folks how it should be done. What does the "H" in "Jesus H Christ" stand for? The Seattle Times also tends to be pro business. They refuse to report on the environmental damage the shellfish industry is causing in South Puget Sound from their expanding geoduck and mussel raft operations. The Seattle PI DID report on this before they closed down. The Times is a disgrace to journalistic integrity. I have seen several deniers cling on to things such as Cliff is saying to claim that global warming is a hoax. If the Seattle Times is going the same thing as many Right wings organizations but on the other side, then lets see some of this time put into calling out the right wing organizations who take the FAR WORSE stance of climate change being a hoax. This is such a political hot issue that our leaders wont touch it with a 12 foot pole because of all the missinformation out there on the topic. Where are you arguments showing your claims of this being such a major issue just decades away? Please show us this work or yours and your colleagues that supports the real issue here. Not semantics about when this is going to occur. There is huge work to be done in our society that will do NOTHING but leach on to blogs such as this to strengthen the argument that this is all a hoax and that the science on this is confused and not in agreement that climate change caused by humans is occurring. This arguing between you and the Seattle Times is akin to them telling us to get off the tracks, while the train is still far away, while Cliff Mass tells us that the train is coming, just not yet. While a huge portion of our society points at your two arguing and says "see, there isnt any train, I told ya so". Why is Northwest weather worst in November?